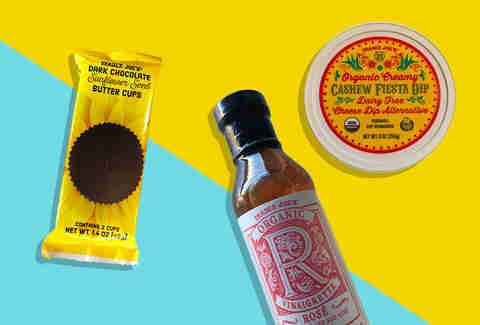 The new year often brings with it resolutions to eat healthier, and because we salute anyone trying to improve their health, we ask that those people stop reading this article about new Trader Joe’s foods immediately. 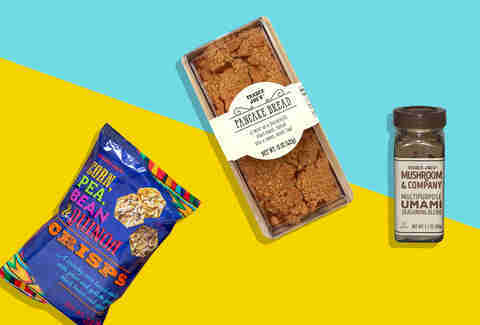 You see, about 55% of the new items mentioned in this article -- all of which are now on shelves at Trader Joe’s, and are TJ’s employee-approved -- cannot exactly be described as health food. They can be described as absolutely delicious and addictive, and you’re going to want to eat them immediately. We even threw in a few fairly healthy items too, for good measure. 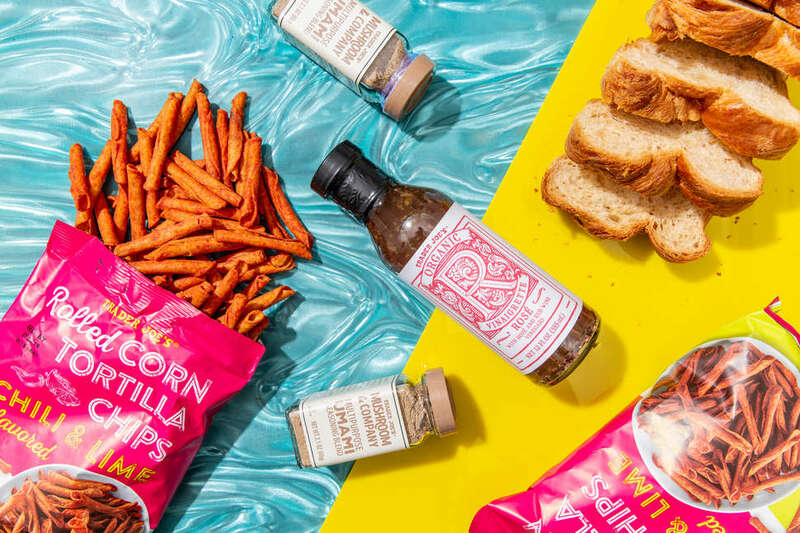 This is all the new food at Trader Joe’s you need to eat right now. If you see a bag of these pseudo-Takis on the shelf, grab it. “They’ve been flying off the shelves,” said San Diego, California TJ’s employee Greg. “We had two full shelves of them yesterday and they’re already gone today.” There’s a good reason they sell out quickly -- they’re addictive, crunchy, miniaturized taquitos with a pleasant kick. Don’t worry, they won’t burn your mouth off. “They’re not quite as spicy as Takis, but the taste is much cleaner and there’s a little more lime flavor, which is nice,” Greg says. Whether you eat ‘em with a sandwich for lunch or to snack on while you’re streaming Marie Kondo, these chips are ultra satisfying. And if they don’t spark joy (to borrow Kondo’s lingo), TJ’s has a generous return policy. This might look like your average loaf of bread, but Trader Joe’s found a bakery to make this cinnamon-filled delight out of croissant dough. “It’s light and fluffy, and it has a hint of cinnamon,” explained Andy from Oklahoma City, Oklahoma. And while he recommends slathering it with everything from Cocoa Almond Spread to Cookie Butter, you can also class it up with a blueberry or grape jelly. If you’re as lazy as we are, you’ll probably just eat this pre-sliced bread right out of the bag. But if you feel so inclined, Andy insisted it makes a fantastic French toast. Kit Kat is a fantastic name for what’s essentially a chocolate covered wafer cook… why, that’s the name of this Trader Joe’s product! We’re a little bummed they didn’t name it something like Citty Cat, but for $.79, you get the TJ’s version of a classic. “It has a different texture [from a Kit Kat] because there’s multiple layers going on,” said Ben in Chesterfield, Missouri. 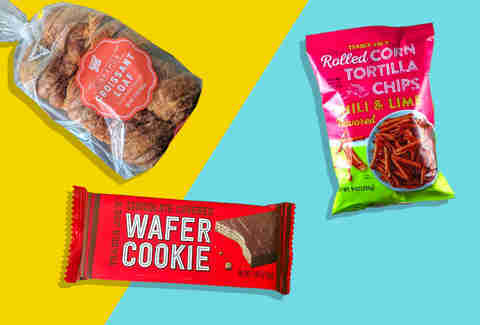 “Kit Kats have the big cookie at the bottom and more chocolate at the top, but this is a little more evened out.” When you load a few of these into your cart as you’re pulling into checkout, just know that you won’t be the first. “We’ve sold a lot of these,” he said. Almond butter and cashew butter are fairly easy to find at the supermarket these days, but have you ever had TJ’s Sunflower Seed Butter? It’s a fantastic choice not only for people who have a nut allergy, but for anyone looking to switch it up from their everyday nut butter. “I find it rather creamier,” said Samuel from the Columbia, South Carolina store. While there are only two Reese’s-sized cups in this pack, it’s probably not long before they miniaturize them and throw ‘em one of those plastic bins. Maybe it’s a good thing. “It’d be dangerous,” Samuel noted. That’s for damn sure, Samuel. Summer’s long gone, but that doesn’t mean you have to stop enjoying the taste of rosé. Sure, you probably shouldn’t enjoy it at work, but you do you. You can safely and responsibly enjoy this non-alcoholic vinaigrette anytime and anywhere since it’s made with both red wine vinegar and organic rosé wine vinegar. “It’s more of a traditional vinaigrette,” explained Daisy from Asheville, North Carolina. Don’t worry about being overwhelmed with super floral rosé notes. “It’s pretty subtle as far as the rosé aspect of it; I just tried it with bread and it was delicious.” If you’re trying to squeeze in more veggies in 2019, don’t worry -- she says it pairs great with veggies too. The words “Organic Creamy Dairy Free Cheese Dip Alternative” usually translate to mean “This Will Not Taste Good And I Will Regret This Purchase.” But in a world where burgers made from plants can taste damn close to the real thing, even though this doesn’t taste exactly like cheese, it’s cheese-ish! More importantly, it tastes great. It can be consumed hot or cold, and we think it’s solid either way. Mike from West Des Moines, Iowa offered up some ways to integrate it into your next meal. “I think it’s better warmed up,” he noted. “It’s got a better texture, like a nacho cheese dip. You can layer it on top of a burrito or dip your chips into it.” One note: don’t let the presence of jalapenos on the ingredient list fool you -- despite its Mexican-inspired flavor profile, it has no kick whatsoever. We spoke to employees all over the country about this seasoning that’s already a cult favorite, but no one could vouch for it. Here’s the good news: We tried it and loved it! It’s usually stocked near the now legendary Everything But the Bagel Sesame Seasoning Blend. It’s not as addictive, but then again nicotine and caffeine aren’t as addictive as that bagel seasoning. But fear not! This is a fantastic addition to your pantry. The main ingredients in the Umami Blend are kosher salt, onion, mustard seed, and two types of mushroom powder. Consider this a way to pump up the mushroom flavor in any dish that could use the help. Sprinkle it into marinara sauce or atop any meat. It’s umami flavoring, after all, and it adds a deeper layer of flavor to anything it touches. Maybe don’t put it on those Sunflower Seed Butter Cups, though. Pancakes? Perfect. Bread? Brilliant. Pancake Bread? Hmm, isn’t that just too much of a good thing? Not at Trader Joe’s, where those geniuses baked bread that tastes exactly like buttermilk pancakes -- probably because the bread has heavy cream, eggs, buttermilk, and maple syrup baked into it, along with a buttery brown sugar topping. “This is the greatest stuff since sliced bread, literally,” said Paul from Las Vegas, Nevada. “It tastes better than pancakes. It’s ridiculous, I’ve eaten like seven of them since we got it.” While Paul heard that customers have liked heating up slices of the ultra-soft bread and putting butter on it, he said it’s not required. “People ask me how I eat it; I just grab a fork,” he noted. Pour yourself a mimosa and cut a piece of pancake bread and you have one easy homemade brunch. You know how when you and your friends are hanging out and someone always goes, “Man, I could really go for some corn, peas, beans, and quinoa right about now?” And then everyone else in the room is like, “I was just thinking that!”? You’re gonna love this new, unappetizing sounding TJ’s bag of chips. And the best part is that they’re actually quite appetizing! “It’s not as healthy tasting as it sounds!” exclaimed Jessica in Baton Rouge, Louisiana. “They’re salty and kind of like a popcorn chip. It’s good with guacamole.” Another TJ’s employee, Paula from Southlake, Texas, concurs. “It’s similar to the texture of those circular sea salt rice crackers we had in. Or those popped barbecue chips, but not barbecue.” Next time you’ve got some guac or a bowl of salsa on the kitchen table, these crisps are just what you need. Lee Breslouer is a writer and editor based in Colorado who has a freezer overflowing with riced cauliflower stir fry. Follow him to freezer burn @LeeBreslouer.